The hiring decisions these days are based on references provided by the candidate. References are asked for and they play a predominant role in recruitment. A recent survey has opened up that apart from interview skills and faultless resume; reference checks play a key role in landing a job. Professional connections can be used as references as they can be the ones who can corroborate your qualification. References can be ones from your previous job, professor or ones whom you have worked for latest. There are few aspects to be noted when references are used, let’s sail through and find out how to use references for a job. Days are gone where reference letters were provided to the recruiter for obtaining a job. What employers look out for is the name and contact details of the references so that they can speak to them and get to know your professional standard, strength, weakness and more. By speaking to a reference the recruiter can judge and frame you if you’re the best fit for the job opening. Reference letters are not much effective as a letter always say something good about a person and is never a two way communication. References can be used by providing the contact details to the employer. It would be a smart idea to have a reference as a separate list with title references so that it can be offered to the interviewer when requested. Remember not to offer reference list unless the employer asks for it. Allot separate categories in your list for references such as academic, personal and employer. It would also be a neat way to avoid using references in the resume. Choosing references is another important smart way as they are the ones who would pave way for your job. Pick and use references who has studied your achievements and whom you think you’re free with. Make sure that the reference you use would say some glowing things about you. It can be your supervisors or colleagues in other department too. Overall references should be ones who know your strength and weaknesses. So use references who know you completely and professionally. You can also pick some reference that is related to the hiring manager. This is because in this mode of relationship, personal connection can be a boost and lead to confidence in recommending. When your unable to get such a connection make sure you get people with good experience as reference in the same company you are applying for. References can be previous colleagues, supervisors whom you worked for, in the same manner a personal reference and educational reference such as mentor can be listed. You can list about three or five references that would be able to speak about your work ethics, your qualification, accomplishments, education, performance and lot more professional matters. It would be advisable to avert family members as references. Former vendors, clients, coaches and business acquaintances are also permitted to list as references. There are many people who accept to be a reference and many decline for the same. So it would be a good plan to ask permission from the concerned people if they could serve as a reference. Use reference by informing them well in advance and also with their interest. When you have decided to pen down a name as reference make sure to collect complete details about that particular person. Get details such as company name, contact number, business number, business address, mobile number, email and more ways to communicate with them. With the numerous references, one will never have an idea about whom the recruiter would get in touch. So it would be good to have good relationship with all the references mentioned. The recruiters can also survey through their own networks or even online, so checking out your online status with whom you’re linked is also important. Speak to the references well in advance and inform them about the position you’re applying for and also discuss with them the possible questions that could be asked by the employer. The reference in this way is educated well in advance and would be cautious about getting a call. Keep your references informed about your status and interview process. Make sure they have a copy of your latest curriculum vitae and also are updated about your accomplishments and skills. The reference should also know what company and what position your applying job for. Use references in this manner so that they don’t panic or confuse any calls they receive. Many people make a mistake by maintaining the same job references for all the positions they apply for. Make sure to use the appropriate reference specific to the job position applying for. Make use of different references for the different job titles you try for. If you’re already employed in a job and in the process of job search, you might have avoided using the present boss as reference. The reason is that the current boss would be unaware of your job search. You can explain the same to your employer and they would understand your situation. You can end up with red flags when you don’t explain and clarify the current boss situation. When you require a favor from your reference make sure you call up and speak rather than emailing them. It is always good to have a good positive relationship with the references as they are the keys to unlock your job opportunities for future. f your reference is willing to offer recommendation letter, you can accept the same. it can be a reference written on file or a LinkedIn recommendation, or also a document written on the letter head of a company. When you have listed a set of references for your job search make sure that you’re in touch with the references for each job search you apply. Though you change your references or no, inform the references for each job you try for. It really eats up much of references time when the employer communicates with the references. Jeff Shane who is an executive vice president of Allison and Taylor says that it is good to give back for using the references. There are many a time the references support the new employer, so give back by sending a thank you note, email or you can also offer them lunch outside or also a gift card. The main asset for your job hunt is none other than references and hence it is your duty to protect them. Make sure you don’t put post their contact details and names on social networking sites, on resumes, and other profiles. They may be exhausted with spam by phone calls, untimed calls and emails. Use your reference at the right place at the right time. Certain companies check with all the references whereas certain do companies just wind up with the first two references. They do not contact them again for any thanks note. And hence it would be a note of courtesy to thank all the references after your job formalities are over. The references are the ones who were willing to help you and hence thanking them is necessary. 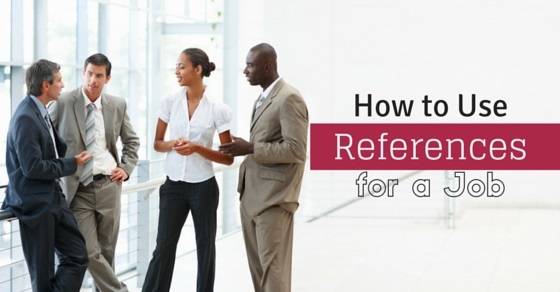 These few ideas about references and ways to use them can be beneficial for job seekers and fresh graduates. Picking the right person as reference is mandatory. A recent survey has mentioned that 63% opened up that when they had to contact the references listed, they did not get positive notes about the candidate. In the same manner 69% of employers changed their decision after speaking to the references and 47% of them said that they had very less opinion about the candidate. At the end only 23% had some good thoughts about the candidate. Judging your abilities and the ability to articulate them is well present with the references. To avert all these bad sequences, picking the right reference and also following the tips mentioned above can be a great way to land a job without hassles. It is hence advisable to have a smooth and good professional relationship with all your workers and higher authorities as their help may be needed anytime in future.